In today’s Malifaux Musings, we’ll take a look at a tournament Jon and I attended in Kingspoint, TN at one of the most impressive game stores I’ve ever been to and, spoiler alert, one of your faithful bloggers took home the big prize! Before that, let’s take a look at some mini-musings. -On February 14th Aaron announced a new contest, the Storied Soundtracks contest. It involves writing a short story based within the world of Malifaux inspired in some way by a specific song. This round’s topic is “Rose Tattoo” by Dropkick Murphys. Anyone who submits a 5,000 word story by March 15th will receive a $15 store credit from Wyrd, and the winner will have their story published in Wyrd chronicles and receive a special payment of $.03 per word, up to 10,000 words. -The Stitch in Time event is still running, and sign-ups are still being accepted. Go join in! It includes quick-play rules for the upcoming 2nd edition of Through the Breach, so there’s no reason not to get into the action! Information on the next Act was released March 6th. And, if you’re participating, I’d love to hear how your groups are doing. My group actually lost a character in this chapter, the first we’ve had die in a TTB game since we started! -An artist who’s done work for Wyrd previously, Tommy Castillo, is working to raise money for a kidney transplant. If you have a few bucks to spare, kick them in and support our Wyrd family. -Wyrd Wants You!...to playtest its next book. Follow the link, and sign up if you think you want to contribute. -Lastly, those who participated in The Other Side’s kickstarter campaign can now manage their pledges through the backerkit page. Additionally, if you wanted to get in but maybe didn’t have the funds, late pledges can be still be added in for certain options. Check it out! 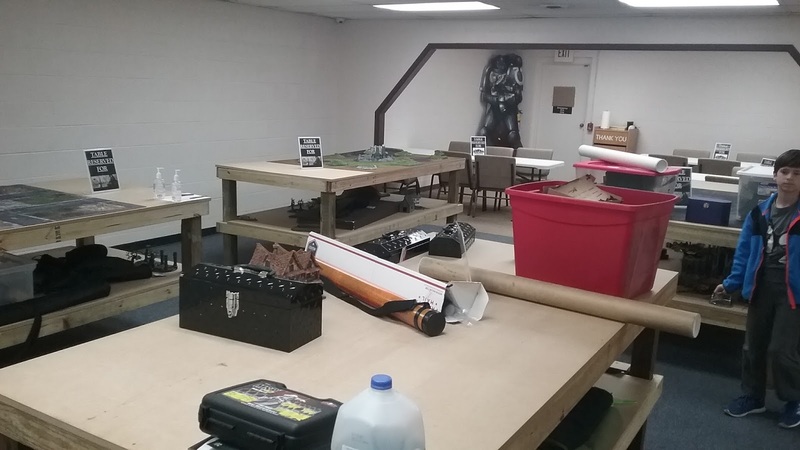 I woke up on Saturday morning, February 18th, and piled out into the car to drive to Bristol, TN and play some Malifaux. In my ears rang the sounds of the hundreds of people who poured out of the woodwork to tell me that my last blog post was wrong and, in fact, the Guild was doing just fine in GG2017, thank you very much. I prepared for the sounds of facebook and google alerts from more comments that came rolling in over the course of the day to continue vehemently making this point. I was well prepared to drown these out with some discussions of the Wave 4 Neverborn models by the fellows at Arcane Reservoir who, disappointingly, don’t seem to think much of Titannia and her crew. Sadness. Then I got there and realized I’d left my reading glasses behind. This isn’t a crippling problem, mind you, but I knew I’d have wrecked vision and a splitting headache by the end of a tournament if I didn’t do something about this. Google maps came to the rescue and I staggered across Kingsport to the nearest drug store, picking up a grey and black leopard spotted pair of old lady glasses that were 1 magnification too strong. On the way back an older looking woman stopped me to assure me that she was, in fact, not a prostitute despite what her mother was saying about her (mom was nowhere to be seen.) This was all happening before 10AM, so I had a feeling it was going to be a weird day. 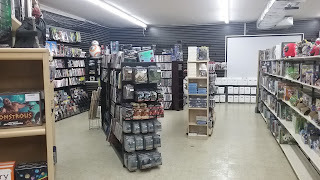 Thankfully, the apprehension was replaced with awe when I came inside Dewayne’s World Comics and Games and saw the impressive interior. 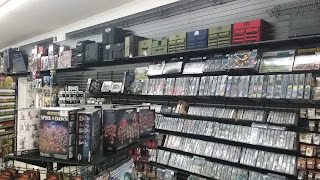 The retail space inside was a massive warehouse-like space filled with games, comics, and collectible statues (sadly no Malifaux, but the owner tells me that may change soon if interest is high enough.) 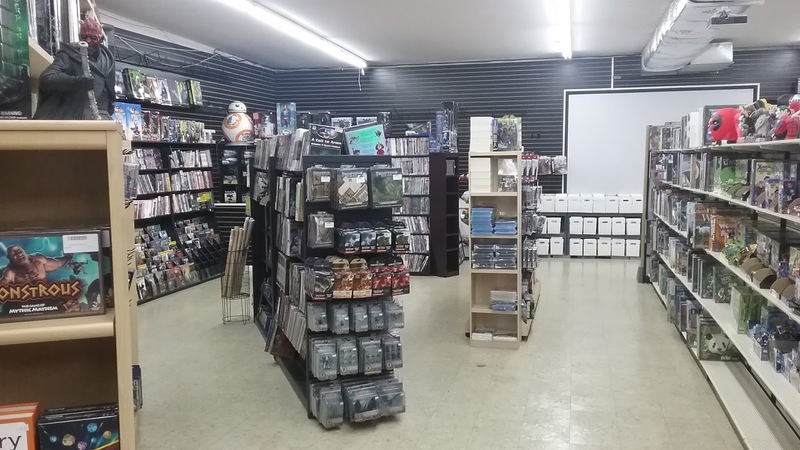 They had recently purchased the space next to them and converted it all to be available for gaming, including tables for miniature and roleplaying games. One clever addition was simply having available a large number of pads of paper and measuring tapes for public use. The space was clean, well stocked, and honestly very impressive. 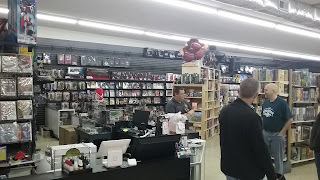 Once they get some Wyrd product in there, they’ll get the full Malifaux Musings stamp of approval ;). The format for the tournament was going to be standard Gaining Grounds but with a different set of generated Strats and schemes for each round than the standard rotation, as the TO had just attended some other Gaining Grounds tourneys recently and wanted to shake things up. Using my standard ultra-scientific method (flipping a card from my fate deck) I’d determined I was playing Neverborn for this one. I inwardly breathed a sigh of relief that I hadn’t flipped another ram since, as we all know, Guild can’t win in GG2017. I’ve become more of a fan of the Hooded Rider of late for various reasons (he’s an Enforcer and kills things later in the game, so he’s less a liability in Frame for Murder. 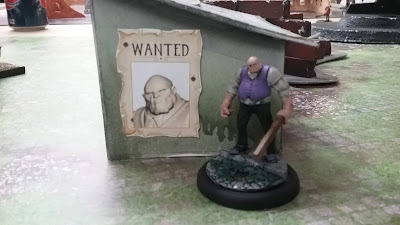 Also, one of the fellows on Arcane Reservoir rates him highly) so I decided he would probably find his way into several of my crews this weekend. Also, it meant I got to play Lynch, which I am always happy to do. However, I had heard in a podcast somewhere (I wish I could remember where so I could attribute it properly. If you’re the podcast in question, let me know and I’ll mention it) a new (to me) way of playing Lillith where you use her not as an offensive piece but, rather, as a disrupter for the enemy crew using Wicked Vines, Tangled Shadows, and Beckon Malifaux to hinder the enemy strategies. Ideally, she wouldn't need to take her sword off her shoulder if things go the way you want them to go. I wanted to give this a try as well, so I kept that crew in the back of my mind for Interference/Recon type games that would involve running around the board and/or dropping markers. We stopped to get some lunch, then moved on to round 2. This time I was playing against Noah, a younger player who I was told beforehand was vicious and who I should definitely not take it easy on. We were going to have a Neverborn-off on a table that featured some laser-cut terrain in the form of a derailed train. Since we were doing Extraction, we got a dayglow Sorrow from someone else to use as the marker and, ostensibly (in my head anyways) we were trying to rescue it from the train and recruit it to our side. This was my first opportunity to try out the Lillith Defense list, with Mama Monster, the Rider, Graves, 2x Depleted, Doppleganger (obv), P. Magic, and maybe some other stuff (I can’t remember.) Noah had shooty Dreamer, Widow Weaver, Teddy, a couple of Stitched Together, Coppelius, and maybe some Daydreams. Pool was Claim, Frame, Dig, Recover Evidence, and Tail ‘Em. I had planned on doing Frame and Tail ‘Em, and then realized I didn’t actually have any legal minions I could use for Tail ‘Em, and switched quickly to Recover Evidence. The game began with my crew fanning out to the left and right around the extraction zone, letting the enemy filter into the middle so we could pounce. Graves threw the Chump Depleted (who I refer to as “Dr. Tentacles”) into melee with Dreamer, Widow Weaver, and a Stitched. 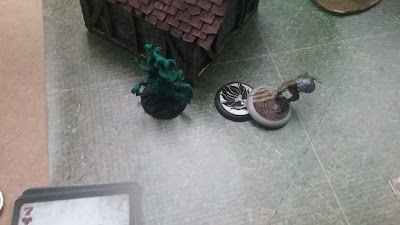 Tentacles managed to do some damage to Dreamer crew people, get beat up in turn by the stitched to near death, but then Graves charged Dreamer and things got weird. I smacked Dreamer with a fence post, which Dreamer then redirected to the Stitched, dealing him severe damage and putting him on hard to kill. Widow Weaver then hit and killed the Depleted, scoring me Frame for Murder and, when the Depleted exploded, killing the Stitched. Rotten contents went off, causing Graves’ Black Blood to splatter on Dreamer. So, yeah, very confused trigger of auras there. Meanwhile, Lillith was Tangled Shadowsing Teddy away from support and proceeded to play Wicked Vines ping-pong with him until we got far enough in the game for Hooded Rider to come in and beat him to death. The game became a bit of a tangle in the mid-table of summoned Alps, Coppelius, the Hooded Rider, Lillith, and the Doppleganger. We managed to run out the end of the game before Coppelius could start doing too much damage to me, and I won this one 10-4. Noah made the one big mistake with killing the Depleted and triggering the death of his Stitched, so no reactivation shenanigans, but Dreamer crews are complicated and I think he did a pretty impressive job. Round 3, on 2 wins, saw me go up to the top table to play this “Jon Goulbourne” fellow, who I had vaguely heard of previously. Earlier in the tournament I had told him about the Lillith defense list, to which he responded “Well I hope we don’t play each other, since I know what you’re doing now.” So, of course, this was happening. He brought in Jacob Lynch, who is Jon’s typical tournament master. He was using Rising Sun Huggy, Terracotta Warrior, Sensei Yu, some 10 thunders brothers, Sidir Archibal with Promises and Recalled Training, and an Oiran. We were playing Squatter’s Rights on Flank deployment, with my taking Leave Your Mark and Undercover Entourage (Lillith) for schemes. I brought in Lillith with Beckon and Wings, Hooded Rider, Doppelganger, 2x SIllurids, and 2x Insidious Madnesses. Because we play each other all the time and have similar thought processes, Jon was on the same schemes, this time with Sensei Yu doing the Entourage. My plan was to use Sillurids and Madnesses to try and go grab the outer squat markers while the sillurids hopped to the back to go drop Leave Your Mark tokens. They were opposed by Ten Thunders Bros who were going to try and move the Insidious Madnesses. I screwed up placement on the bottom squatter marker, allowing the Ten Thunders Bro to ignore the Madness entirely and just hop over him with dance of the heavens, flipping the marker and blocking me from taking it. The other sillurid and madness fell victim to Sidir’s Recalled Training machine gun fire, which is horrific if you’ve never faced it before. On top of that, I poked the Hooded Rider’s nose out too early and nearly got him killed from Lynch and Huggy, who were hindered by Wicked Vines and Trees but not completely blocked since Yu could remove the Rooted condition from them. Things were getting a little rough, is what I’m saying, and I may have lost my temper and broken the frames of my newly purchased leopard spot glasses dropping them on the table in frustration at the end of turn 2. Pictured: How not to defend a Squat Marker from your opponent's 10T Brother. And then it started to turn. 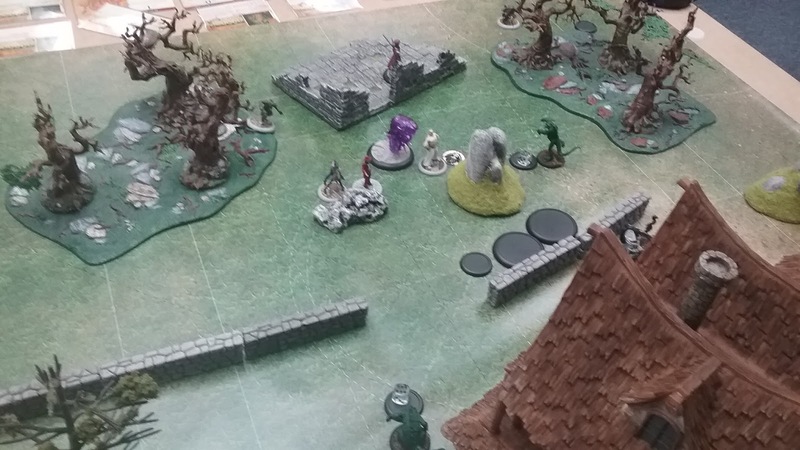 Some lucky flips on Turn 3 and key tree placement managed to flip squat markers so I could at least score off the strat and keep Lillith from drying in retaliation from the enemy. 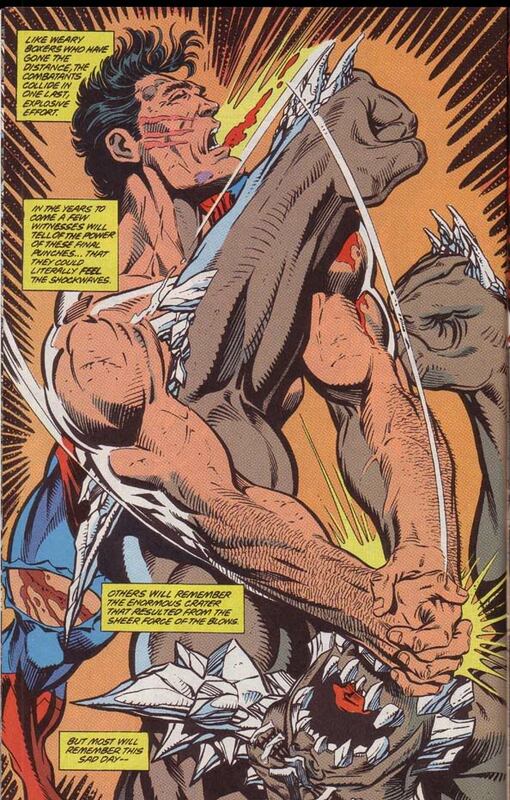 The Doppleganger in the meantime was causing trouble for the enemy, making Huggy come kill him while flipping squats and generally being a nuisance. 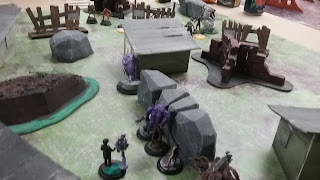 The surviving Sillurid was frantically dropping scheme markers for Leave your Mark, and the Hooded Rider redirected to one of the enemy’s Ten Thunders Bros, parking on his Leave Your Mark Marker turn 3 and eating it Turn 4 to heal himself using Malifaux Provides. This gave him enough wounds to slide up to the now undefended right squat marker, flipping it for our team and letting us resume scoring for the strat before he was punched to death by the Terracotta Warrior (btw, they do a surprising amount of damage). Lillith, meanwhile, spent the end of the game allowing herself to be lured towards the enemy deployment zone by an Oiran. Huggy chased her down and managed to get her engaged Turn 4, but on Turn 5 I rooted him, used Tangled Shadows to jump into base to base with the Oiran (leaving Huggy’s melee range) and then maul the Oiran to keep myself safely at full wounds. I knew Sensei Yu couldn’t come back to unroot Huggy, as he was going to need to sprint for MY deployment zone for Jon’s Entourage. And, in the end, the Sillurid managed to get enough scheme markers dropped and picked up over the last set of turns without getting shot to death by Sidir, allowing the game to finish in a 9-9 tie. Artists rendition of the end of the game. With my greater differential, I managed to take down 1st place in the tournament and, fittingly, won myself an alternate Barbaros model (I have a metal Lillith boxed set, so I did not own a Barbaros. I was thoroughly pleased with this.) Additionally, my Mr. Graves won the painting competition! I’ve never won a painting competition before! 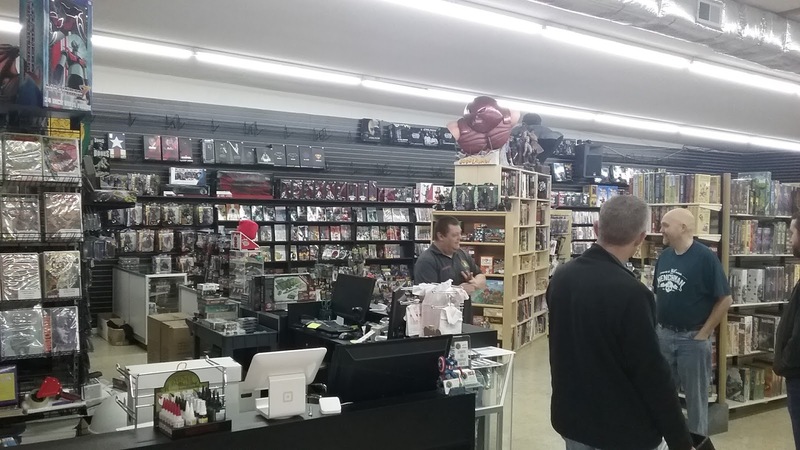 So, yeah, it was a damned good day of Malifaux in a very cool store. What more could you ask for? Finally, don't forget the NRVFaux tournament, coming up in a little under 2 months time. 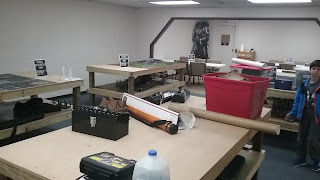 It's a 50ss Gaining Grounds tourney with door prizes, con credit as bonus prize support with retailers at the show, and the standard Wyrd prize support. Come on down and check it out and, if you're coming, feel free to sign up through our tournament's Bag o' Tools page!